Sitting south of the border reading the news and watching videos proved to be a very sad week indeed. Not solely the news out of Ferguson, Missouri, but more deeply what those events tells us. It made me wish, almost, that the hot topic was Kim Kardashian. When I was a child, yes I know that was a long time ago, I remember seeing three restrooms at gas stations: Men, Women and Colored. 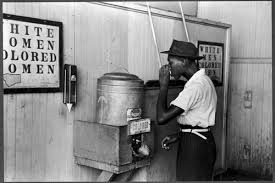 I remember seeing a designated water fountain, or in this case cooler, for black people. There were many pools that didn’t allow blacks. 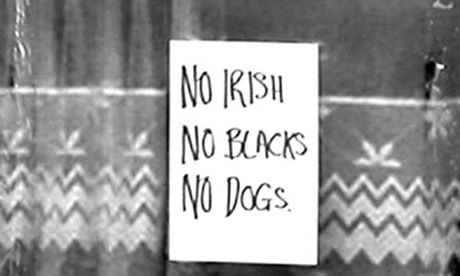 These vestiges of racism are now gone, but racism is not. I worked with a black lady in Chicago. She and I had many conversations about racism. Being Caucasian from a little town in southern Indiana, I truly didn’t know anything about it. I once asked her if there was more or less racism in the North as compared to the South. She said it was much worse in the North. In the South in was overt – right out there in the open where you could deal with it. In the North it was covert – alive and functioning, just hidden neatly beneath the surface. That’s now what has happened throughout the US. Racism has gone covert. Let’s try some examples. These “gentlemen” in the photo are proving their manhood by openly carrying loaded firearms in a Target store. Now what do you think would happen if these were black or latino men. Spend a minute thinking about that scenario. 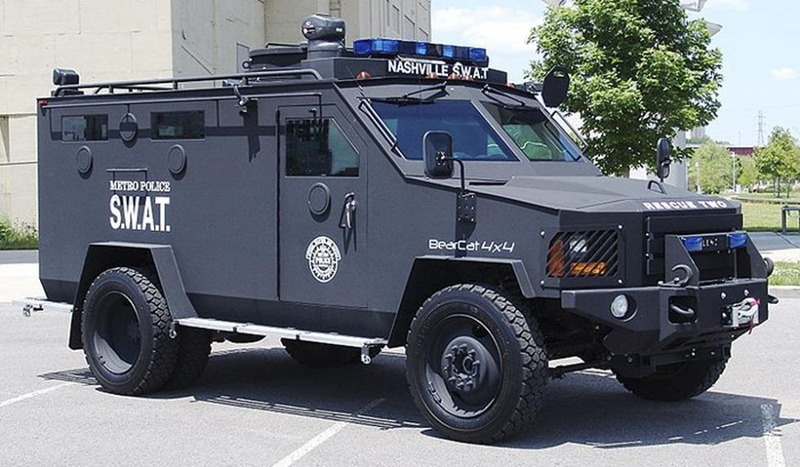 IMHO there would be a fully decked out SWAT team there in 3 minutes. 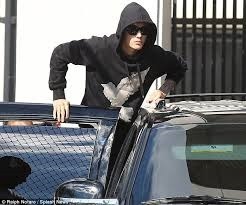 Suppose I told you that I just say a young man in a black hoodie, wearing sunglasses with his hoodie up. And that I saw him running and jumping into a black Escalade. What’s the first thing that comes to mine – certainly not Justin Bieber I’ll bet. Why can’t a young black man wear his hoodie up while walking home from a 7/11 on a rainy night without being shot? Nationally, according to the U.S. Census, blacks are incarcerated five times more than whites are, and Hispanics are nearly twice as likely to be incarcerated as whites. The young, the male, the black and the latino are disproportionately incarcerated. Almost 9% of black men in their late 20s are behind bars. Michael Brown’s murder in Ferguson is not a social anomaly. It is the direct product of deadly tensions born from decades of housing discrimination, white flight, intergenerational poverty and racial profiling. 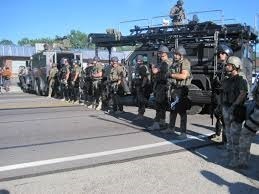 The militarized police response to peaceful assembly by the people is some ways mirrors what happened in the 1960s during the Civil Rights Movement but, to me, is much more deadly. In a series of decisions made since Roberts became chief justice and Justice Samuel Alito replaced Justice Sandra Day O’Connor, the court has steamed openly toward elimination of any meaningful remedies for structural racism, while undermining basic protections against discrimination for minorities. 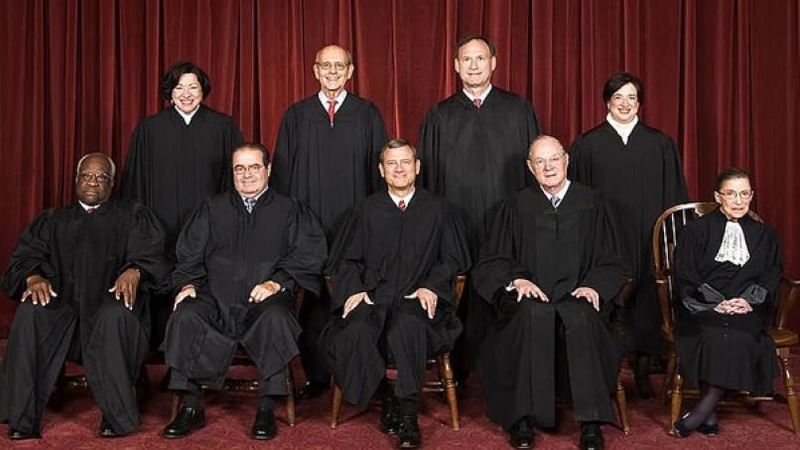 Roberts’ approach, Attorney General Eric Holder said, “presupposes that racial discrimination is at sufficiently low ebb that it doesn’t need to be actively confronted.” On this point the Robert’s court is flat out wrong! Racism is deeply embedded in the fabric of the US. Electing a black president has brought much of this to the surface. I firmly believe that most of the angst over things that President Obama does or doesn’t do is racism – plan and simple. Now, not tomorrow, is the time to start unwinding the systemic biases in the social and economic systems of the US. Yet another war the US hasn’t won. Why? Because it can’t. Prostitution has been around since folks moved out of the Garden of Eden. It was common in ancient Israel, despite being tacitly forbidden by Jewish Law. The laws on prostitution vary considerably around the world. They can vary from total prohibition to minimal regulation. In practice neither capital punishment, incarceration, nor remedial training have had any appreciable effect on the prostitution. The issue is socially and politically divisive. In Germany prostitution is legal. In the US the laws against it are selectively enforced. The simple fact is prostitution is not going away. Legalize it, ensure the health of the prostitutes and tax the profits. 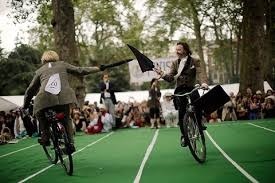 This would take the criminal element out of it. Beside the criminals only the police would be losers; they would lose the easy busts to justify their budgets. OK, Prohibition – how’d that work out? Prohibition was mandated under the Eighteenth Amendment to the U.S. Constitution. Enabling legislation, known as the Volstead Act, set down the rules for enforcing the ban and defined the types of alcoholic beverages that were prohibited. While Prohibition was successful in reducing the amount of liquor consumed, it stimulated the proliferation of rampant underground, organized and widespread criminal activity. 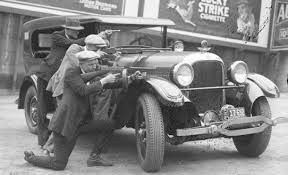 Many were amazed with the rise of spectacular gangland crimes (e.g., Chicago’s Saint Valentine’s Day Massacre), when prohibition was supposed to reduce crime. Starting to sound familiar? With this preamble you’ve probably guessed where I come out on the War on Drugs. Drug use in the U.S. has been on a steady rise ever since criminalization began. Overdoses have become more common as more laws have been put into place, and arrests have been increasing for nearly 30 years. The “War on Drugs” began under President Nixon, but really took hold in 1986 with the Anti-Drug Abuse Act. In my every to be humble opinion natural drugs should be legalized, tested for purity and taxed to provide money for drug education and rehabilitation. I also believe that everyone in incarceration for the use of cannabis, cocaine or opium should be set free, if they agree to drug education. If these “natural” drugs are priced with a normal profit, then most of the manufactured drugs will be forced out of the marketplace. 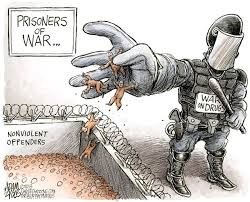 Of course this will never happen because there are too many vested interests in the “War on Drugs.” · For Profit Prisons – In 1980, there were 41,000 drug offenders in state and federal prisons and jails. In 2011, there were 499,000 drug offenders behind bars. 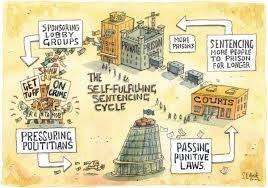 Through lobbyists, private prison corporations, according to InthePublicInterest.org, have contributed to a number of laws aimed at arresting more people and keeping them incarcerated for longer periods of time, such as mandatory minimum sentencing, drug offenses and immigration violations. 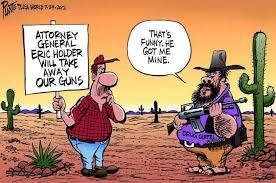 · Local Law Enforcement – As of 1994 the Justice Department had transferred almost $1.4 billion in forfeited assets to state and local law-enforcement agencies. Some small-town police forces have enhanced their annual budgets by a factor of five or more through such drug-enforcement activities. 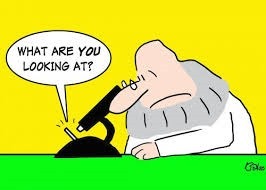 · Big Pharma – If we examine the process that pharmaceutical companies traditionally use to maximize profits, we see that there is a life cycle to most medications that they produce. They will produce a medication until the patent expires, then they will introduce a replacement medication, usually at a higher cost, which may or may not actually perform better than the medication that was replaced. 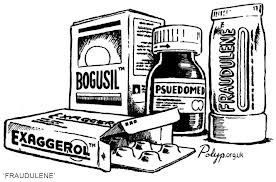 They, of course can’t manage the product life-cycle of a natural drug, much to the detriment of their bottom line. 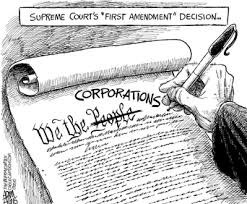 Now that corporations are people, just with lots of money and lobbyists, they hold sway over the political process. So, you see, with all of interests profiting from the “War on Drugs” what chance is there of any reasonable change? It is truly a sad state of affairs. I’ve not been blogging for a while – some health issues but mainly I just didn’t have much to say. Well, that’s changed. When I lived in the US, I thought it was a pretty awesome place. But like most, I had “US is the best country in the world” blinders on. 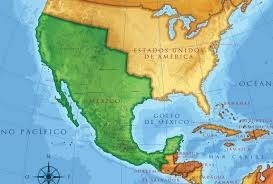 I am now an expatriate living in a very safe and sane part of México. After living outside of the US borders for almost 6 years, I’ve come to see the US in a totally different light. The sayings “take a step back. Clear your mind. Refresh your perspective” and “can’t see the forest for the trees” seems, to me, to be very appropriate for the blogs which will follow. Being retired and living in another country allows me to view the US with a little less bias. First some “facts” that I have learned over the past 5 some years. The US does not have the world’s best healthcare, that’s a whole blog in itself, nor does it have the respect of the rest of the world. It is an imperialist power[i] and has been since Polk’s presidency. It has the world’s largest military, but hasn’t won a war since World War II. It spies on its enemies, friends and citizens. The citizenry are scared; they are afraid of a black president, people of color, most religions, any language other than English and, quite frankly, their own shadow. You may not like what he says, but his stats are right on. I follow the news from the US quite closely; my pension and Social Security are funded from the US and so I have a very vested interest. Some of my comments will probably seem harsh to most readers. But I no longer work for a corporation so I can say it pretty much exactly the way I feel it and see it. There are so many topics to cover so I’ll start with the one that is at the top of my list – Congress. My headline for any discussion for the current Congress would be buffoonery. These people are an international embarrassment. The House has, thus far, passed 57 bills to dismantle ACA (Affordable Care Act) knowing full well that it will never get past the Senate or the President. Insanity: doing the same thing over and over again and expecting different results. – Albert Einstein. Plus the fact that the US is the only industrial nation without universal healthcare – what a disgrace! The Senate is hamstrung by the threat of filibuster, so it takes a supermajority to get anything out of that chamber. These people are professional (using the term very loosely) politicians; they only have one goal – to get reelected. What the majority of the country wants is immaterial. There’s jobs to be created, infrastructure to be repaired, tax code to be redone and immigration issues to be solved, just to name a few, yet they do nothing. I almost feel sorry for House Speaker Boehner, he has two political parties to herd: Republicans and Tea Party. Those two groups can’t agree with each other, much less agree with the Democrats. And what can he do? With the rampant gerrymandering, whomever wins the primary wins the election. More and more it appears that elections are won or lost in the primaries. I, for one, am not even allowed to participate in the primary because I’m a registered Independent. I’m still waiting for the fiscal conservative, social liberal party. The US is going to continue this downward spiral (and yes watching from the outside it is spiraling down) until/unless politics can be cleaned up a little. I’m not Pollyanna, I don’t expect honest politicians. What I would like to see for a start is congressional districts based upon natural boundaries: major highways, rivers, mountains – something you can see on a map. The result would be candidates that would have to have a general appeal to win the election – not wingers, left or right. Hola amigos, Nancy here! I will be filling you in on the adventures today as Barry is holed up in the room with a stomach bug. 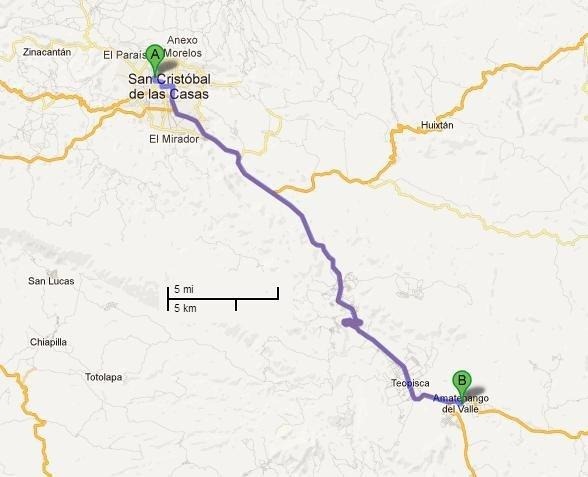 Today about half of the group traveled on a road named La Garita to the community of Tenejapa. 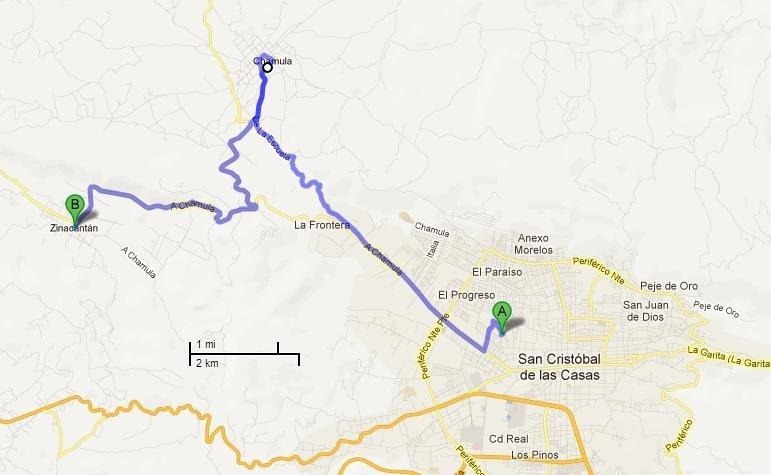 It is located in the mountains just 28 km east of San Cristóbal and is known for its textiles. 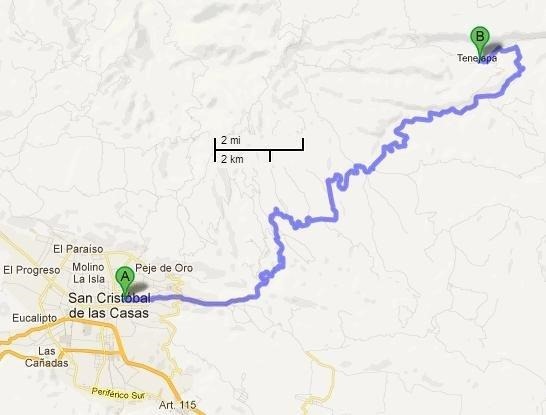 The drive to Tenejapa took us through some beautiful mountain scenery. On the way we saw the incredible Romerillo Cemetery, with a line of huge blue and green Maya crosses overlooking the simple tombstones. The road continued on around Mount Tzontehuitz, at 9,514 feet the highest mountain in the Chipas highlands, then dropped down into Tenejapa. 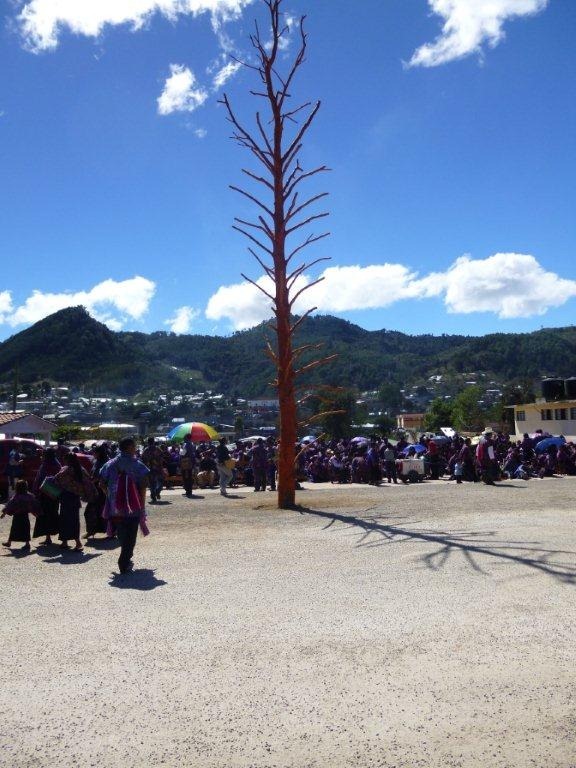 The main square directly in front of the church was already filled with people. 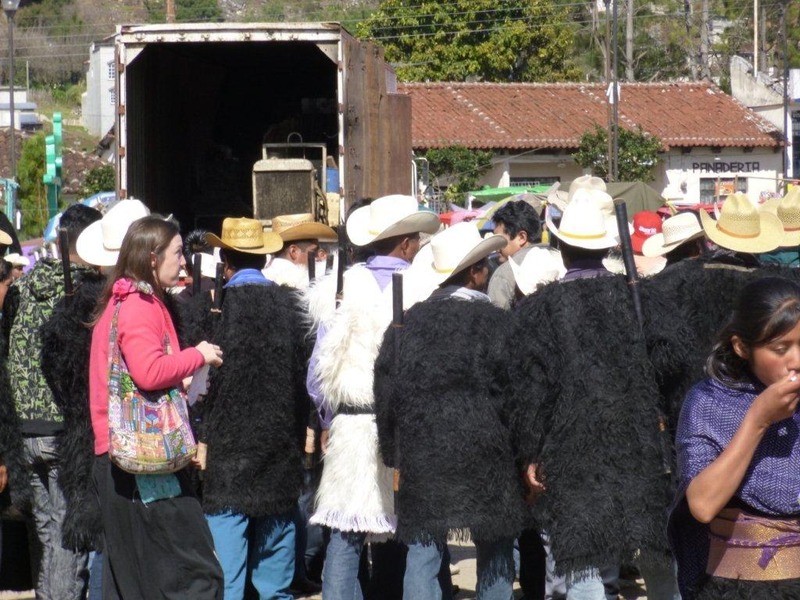 Immediately we noticed that the clothing the men wore was much different than what we had seen on other villages. Inside the church, the villagers were sitting along the walls on long benches and chairs. The floors of the church were covered in pine needles like what we had seen in San Juan Chamula. The saints were all ready for the procession around town, dressed in their finest. One of the elders was kind enough to explain to us who each of the saints were. Soon after we left the church we heard music coming from a side street. 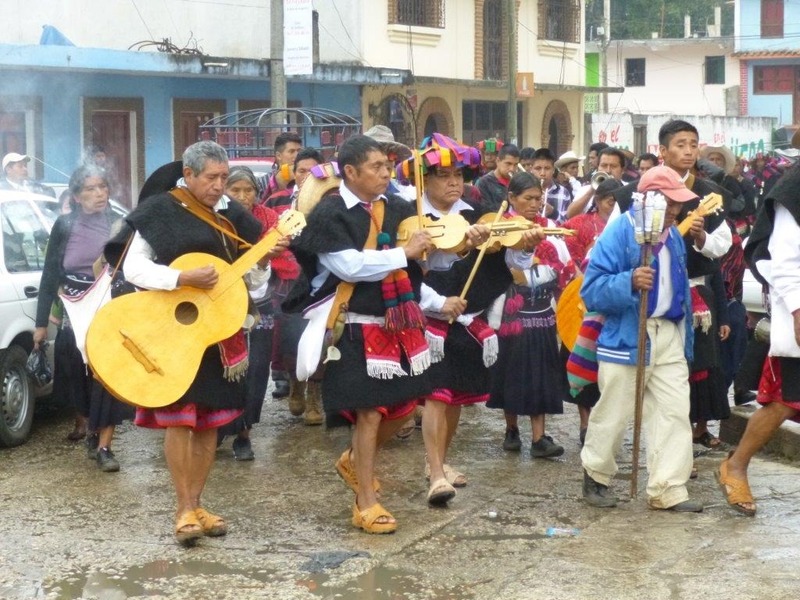 A band of men in traditional dress playing traditional instruments marched to the front of the church. During a short musical interlude provided by young men with more contemporary instruments; several types of horns, guitars, fiddles, etc. during which “pox” was passed around along with large bottles of SOL beer, the ever present fireworks started. This was the first time I had actually seen these large, homemade fireworks set off. Let’s just say, I was amazed these guys still had all their fingers!! It also sort of explained why everyone was smoking cigarettes. The procession of the saints left the church and started making its way around the village. A few of us decided to follow along for the full experience. Marina had convinced Sebastian, a local musician and music teacher to chat with us about the town. He was kind enough pose for pictures showing off his colorful clothes. His focus was on music and the traditional instruments. Unfortunately, we were a day early to experience the Thursday market that this village is known for but luckily we were able to visit Sna Jolobil, an award-winning cooperative which was founded in Tenejapa. The excellent quality and unique style of its textiles is what the town is known for. 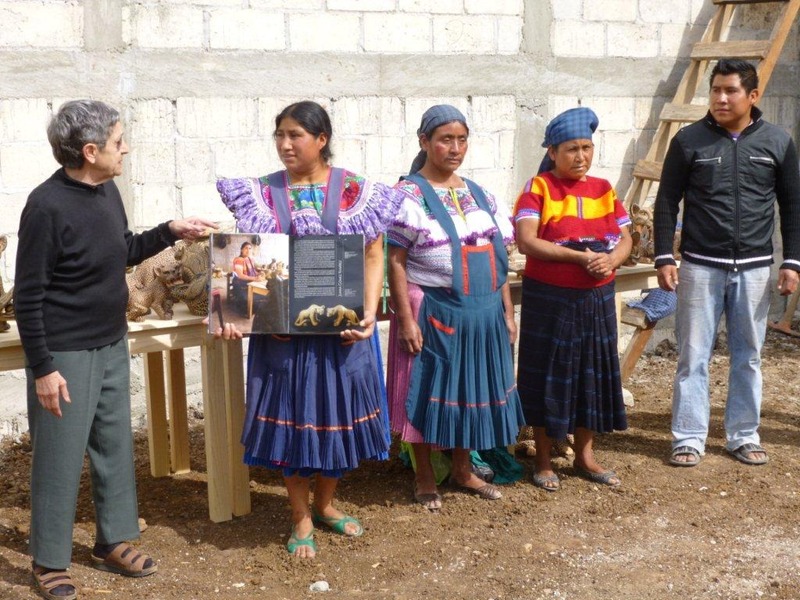 The COOP has a small workshop/store just a few doors from the main church and our luck held as María Meza, the cooperative founder, was in and working. 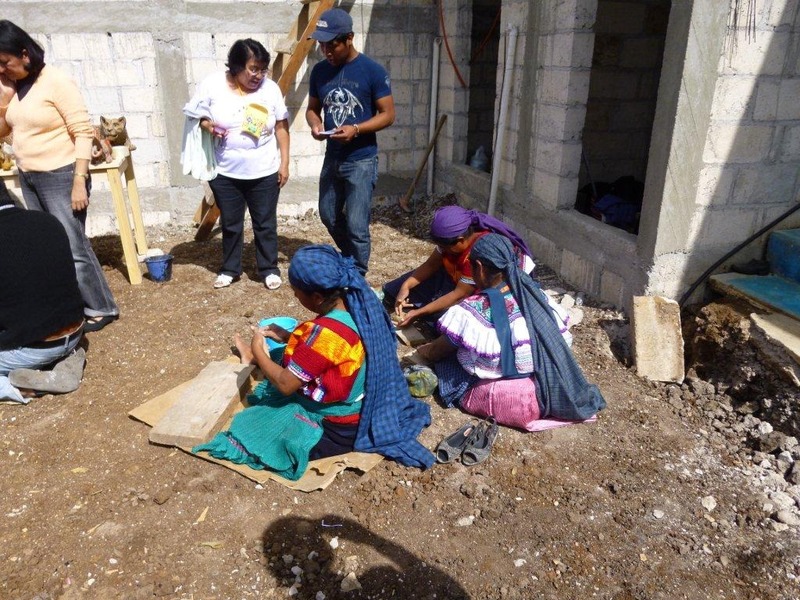 María was kind enough to show us her work but we were not allowed to photograph her, especially when she was working on her loom. 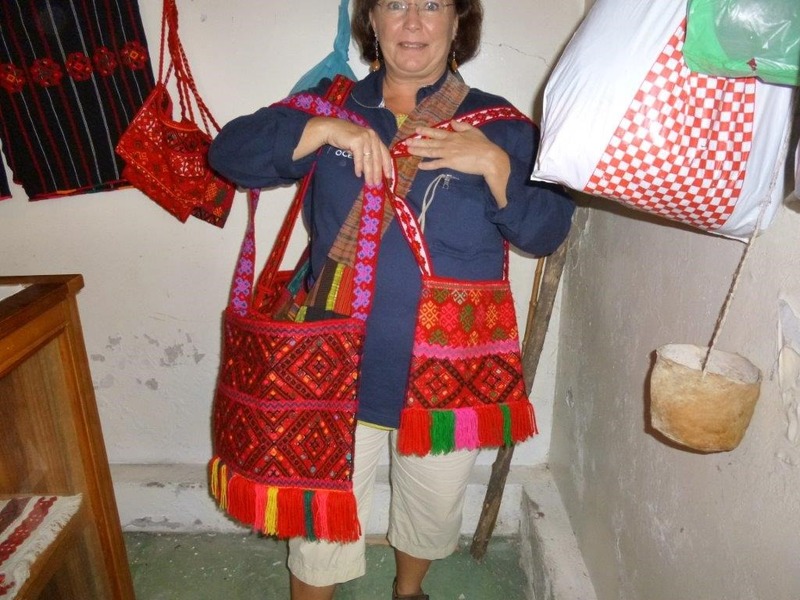 Here are photos of Cindy modeling handbags offered at the shop and Janean modeling other items. One of Marina’s students that took this trip last year described the visit best…you feel like you are in the middle of a National Geographic special. It was an incredible day and I am just sorry Barry missed out on it. 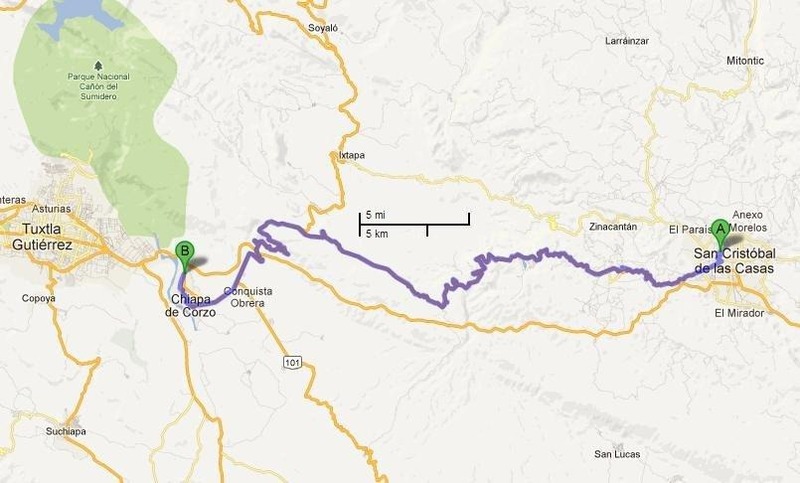 The first stop of day 5 was Cañon del Sumidero which is 73 km from San Cristobal on highway 190. 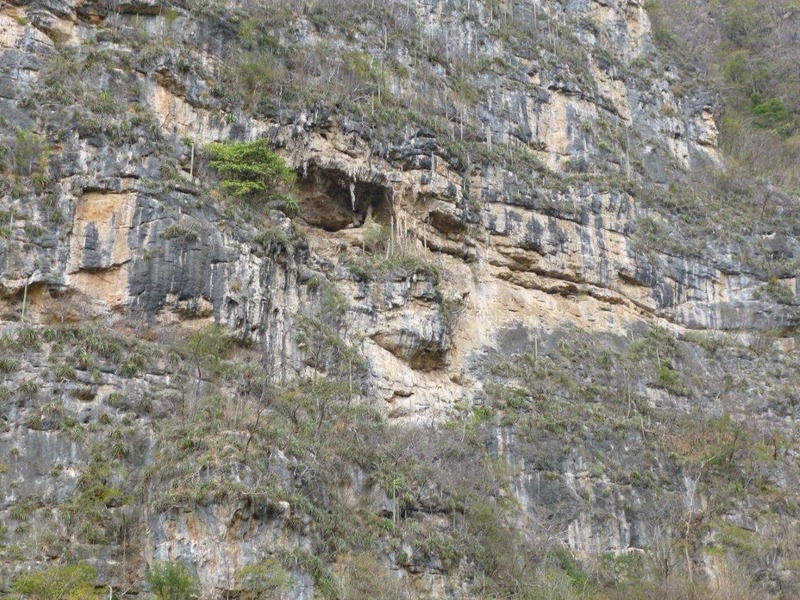 The cañon (canyon) is the second most visited site in Chiapas, after Palenque. Commercial activity in the park is solely to serve tourists. 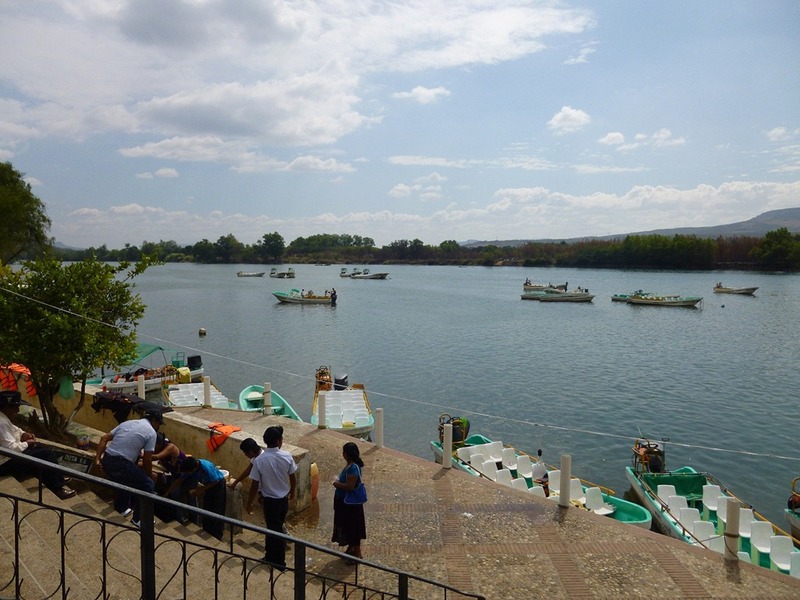 There are two docks which provide six tour cooperatives of about 120 boats. The boats range in size from ten to forty passengers. 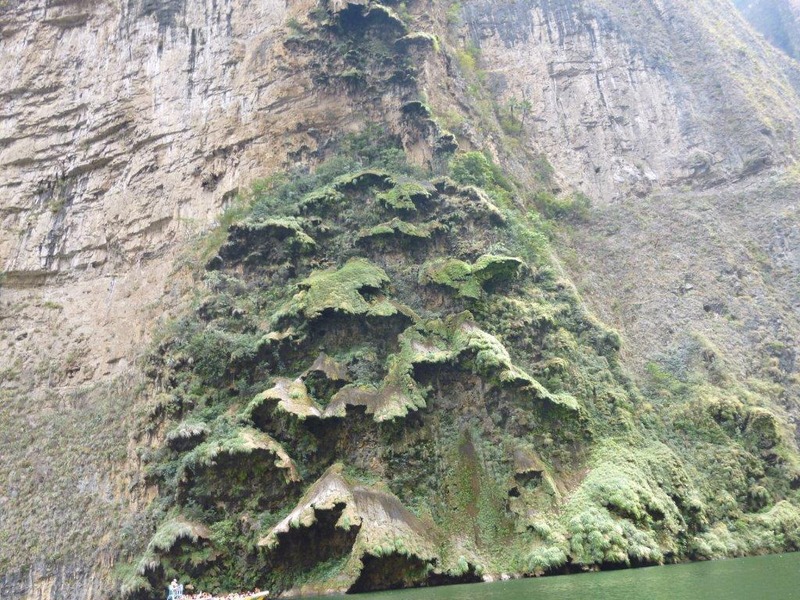 El Cañon del Sumidero is a narrow and deep canon just north of Tuxtla Gutiérrex in a national park. It was formed by the Grijalva River which still runs through it. The canon has vertical walls as high as 1,000 meters (3,280 feet) for the 13 kilometers of the narrow passage, but most vary from 200 to 700 meters tall. The width of the canon varies from 1 to 2 kilometers. 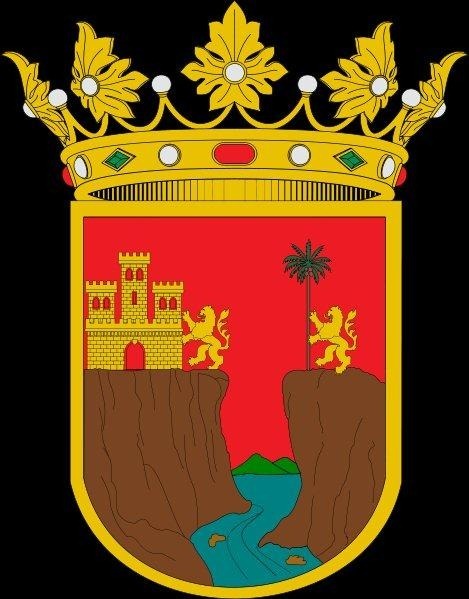 The crest and flag of Chiapas proudly features the cañon. The best known of the area’s many caves is the Cueva de Colores (Cave of Colors). It is named so because of the minerals (particularly magnesium potassium) that leach from the walls producing many colors, most notably pink. 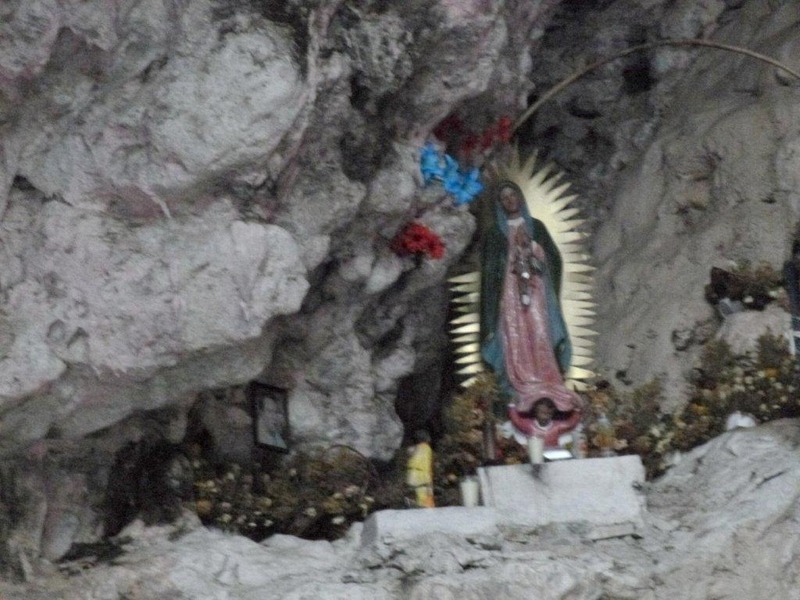 The Cueva de Colores contains a Guadalupe, usually surrounded by candles and fresh flowers. Most of the cañons vegetation is rainforest. 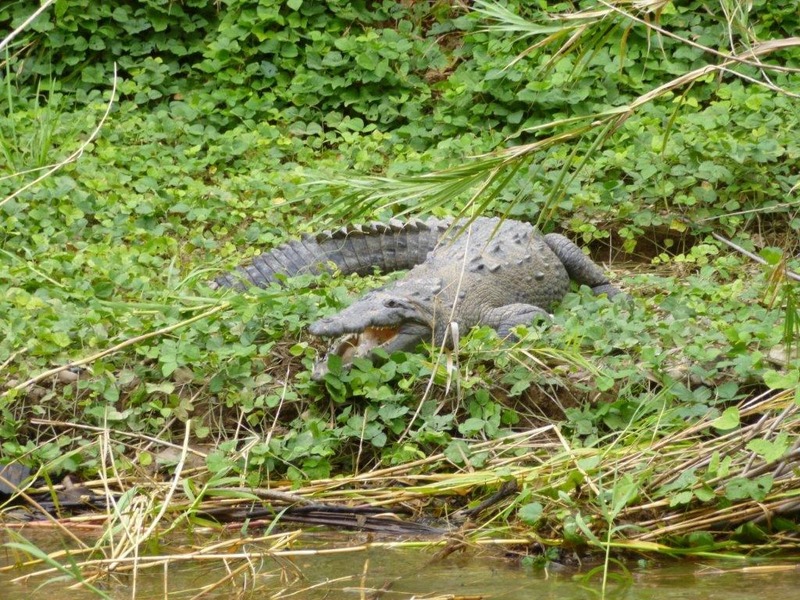 There is also abundant wildlife here. On our voyage into the cañon we saw crocodile (Crocodylus acutus), spider monkeys (Ateles geoffroyi) and buzzards (Sarcorhampus papa) just to name a few. The Chiapa settled this area fortifying the higher areas for protection from invasion. Lead by Socton Nandalumi, the Chiapa fiercely resisted the Spanish and held out on the cliffs until 1535. 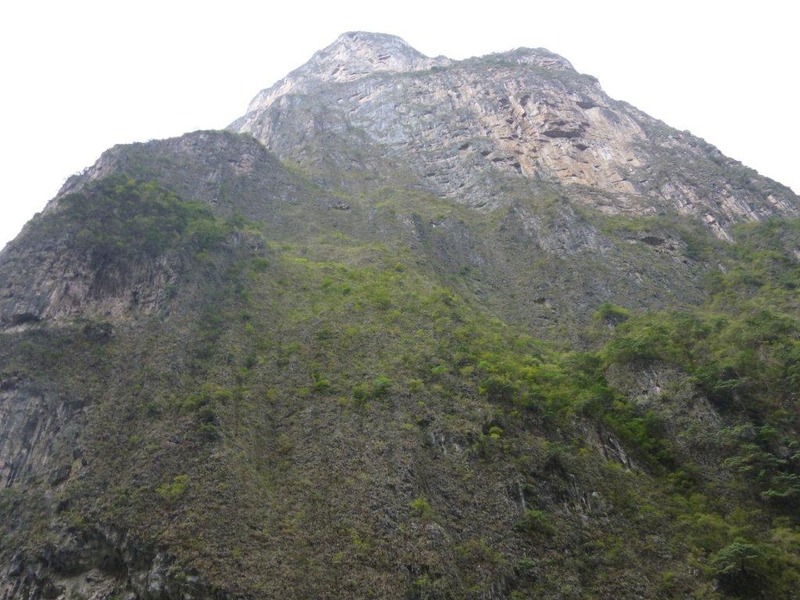 Legend has it that when the last fortification fell, the remaining Chiapa (about 5,000 men, women and children) committed mass suicide by jumping off of the 1,000 meter cliff. When the Spaniard leader Pedro de Alvarado saw this, he backed off allowing some of the Chiapa to survive. 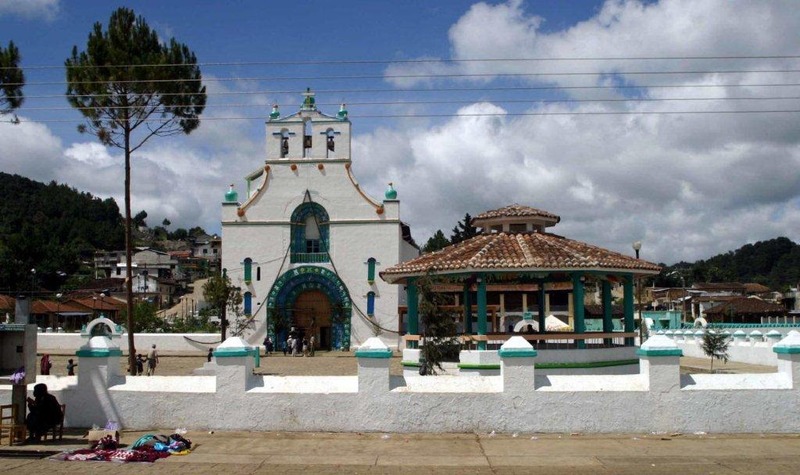 Chiapa de Corzo is a small city located in the Grijalva River valley. Chiapa has been occupied since 1400 BCE. 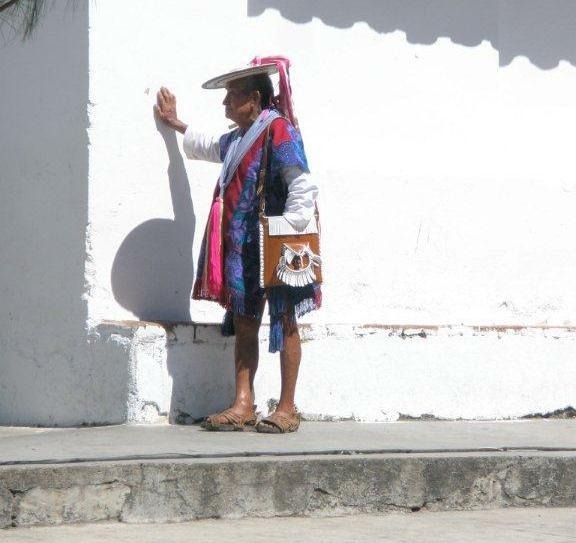 Originally populated by ethnic Soctona, who the Aztecs called Chiapas. These people were fierce warriors and held out to the death against all invaders. 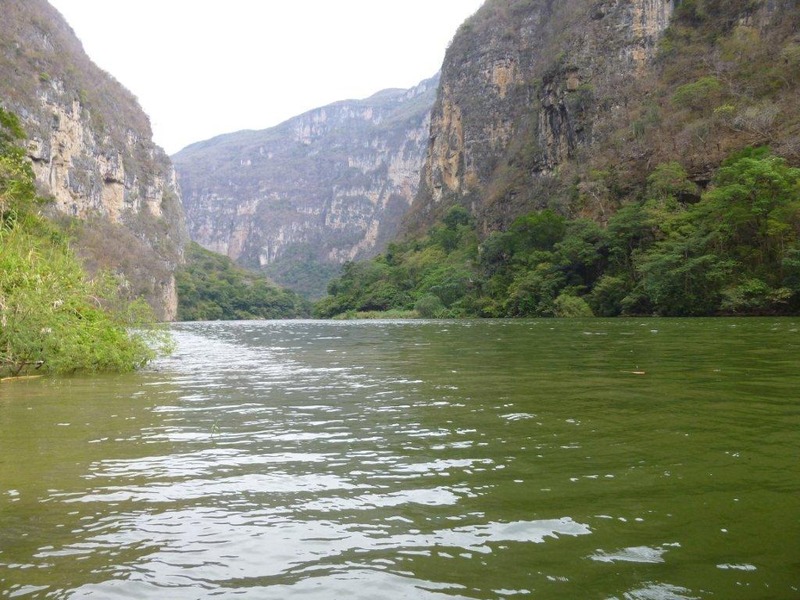 Chiapas means water that runs under the hill, a very appropriate name given the cliffs created by the Grijalva River. 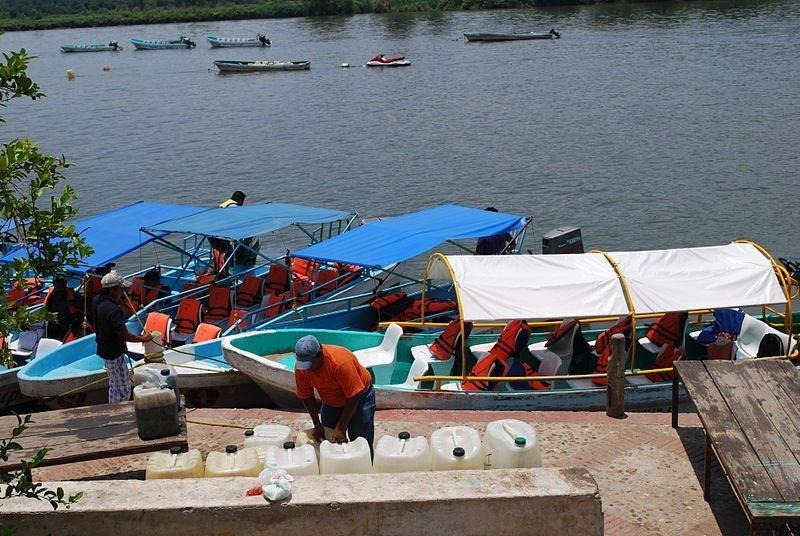 In Chiapa de Corzo the Grijalva River provides commercial transportation and a riverfront area for merchants and restaurants. 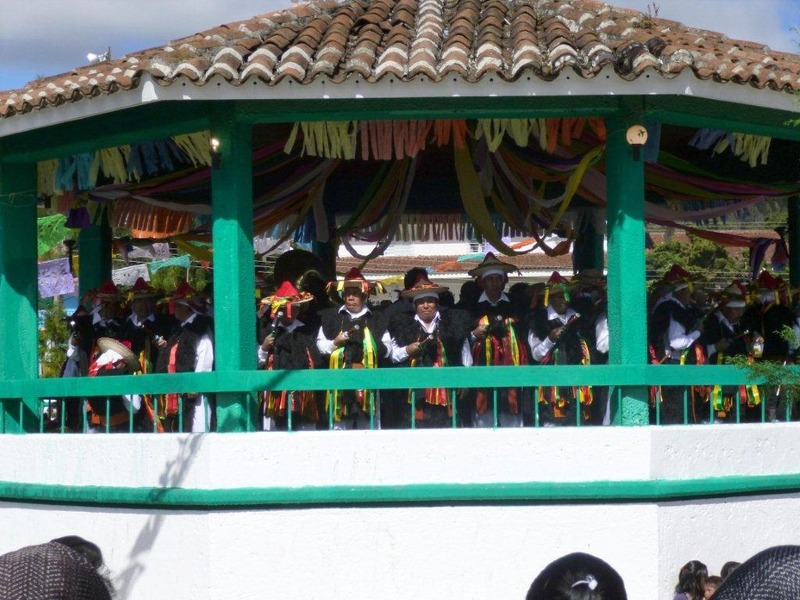 La Fiesta de los Parachicos dates back to the fifteenth century and celebrates the legend of Doña María de Angula. Doña María was a distinguished, beautiful, rich and very Catholic Spanish lady who lived in the ancient city of Guatemala. She came to the town of Chiapa de la Real Corona in the mid-eighteenth century in search of a famous indigenous healer. She was searching for a cure for her small child who was the victim of a strange disease. 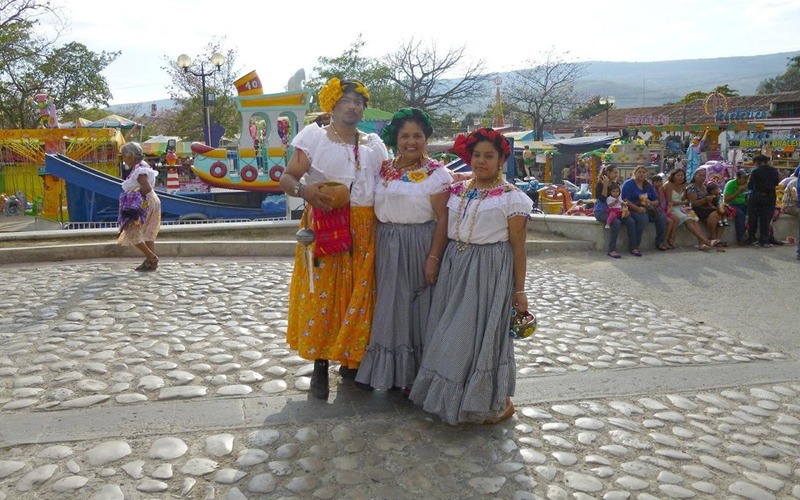 Dona Maria de Angulo arrived in Chiapa with her maids and servants. 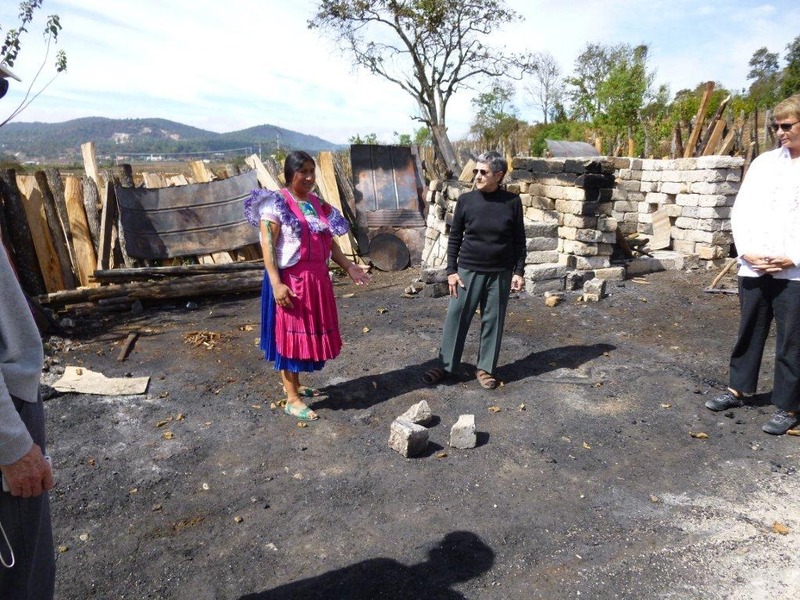 When she arrived in Chiapa, she was directed to a local healer named Namandiyuguá. After examining the boy, he instructed the mother to bathe him nine times in the waters of a small lake named Cumbujuya. After the "treatments" he was cured. 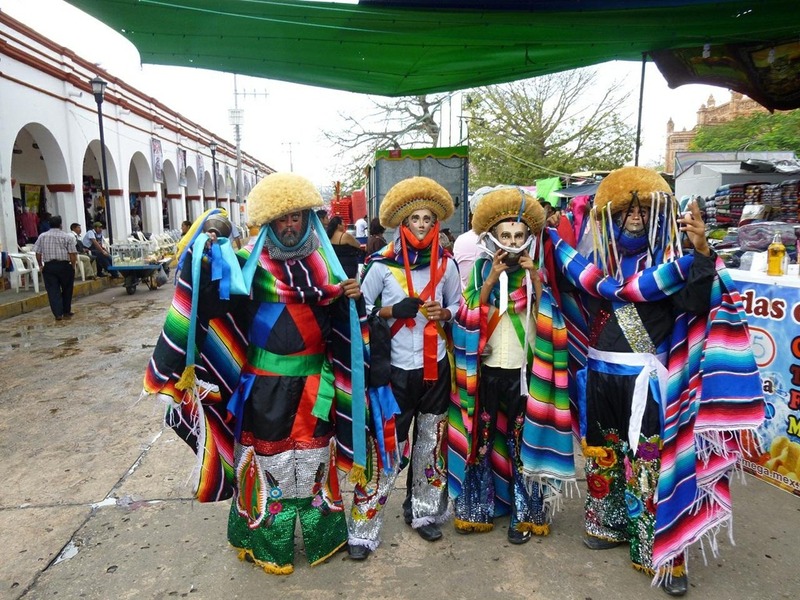 To distract and amuse the boy, a local group disguised themselves as Spaniards with masks and began to dance “para el chico” which means “for the boy." 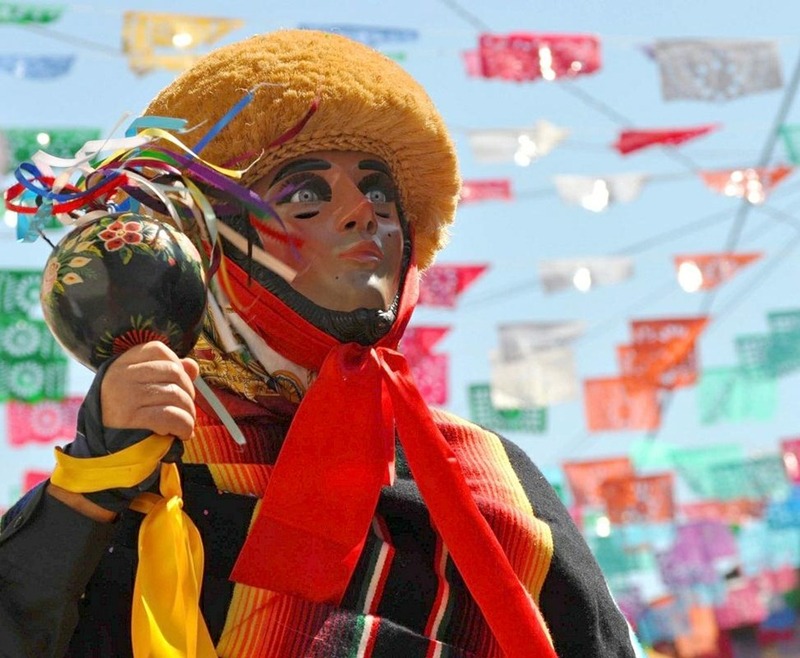 The Parachico costume is composed of a finely carved mask of wood with Spanish features; light skin color, light blue or green eyes, with a goatee. 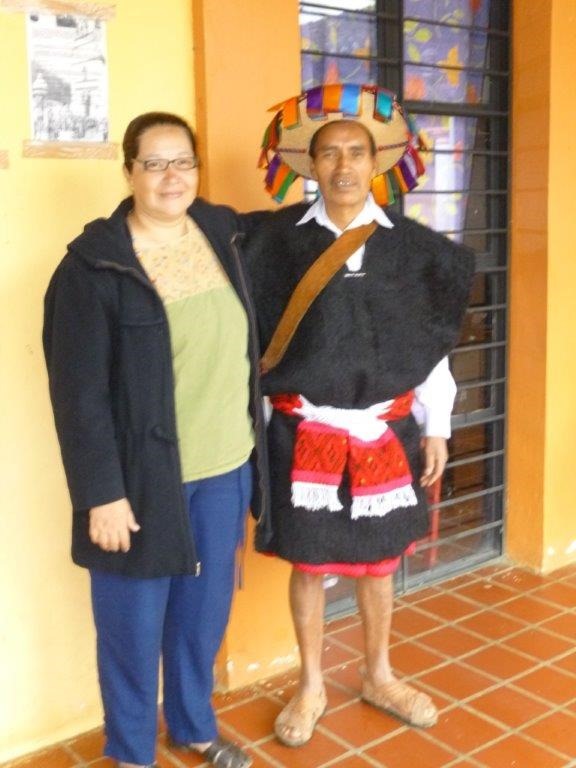 To complete the costume there is a satin scarf, black shirt and pants, a colorful serape and one chinchín (rattle). 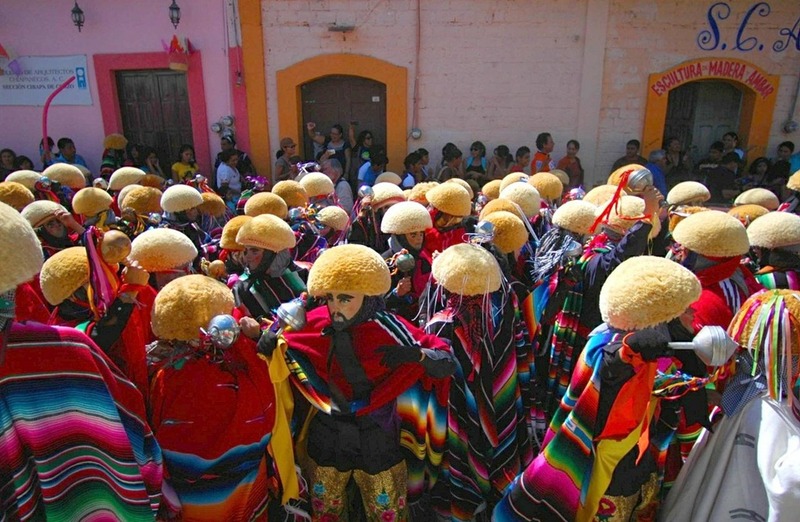 Accompanying the Parachicos, or sometimes dancing on their own, is another type of dancer called “chuntas.” These are men dressed as women as the word chunta means maid or servant. These figures represent the maids and servants of Doña María. Most of the men dress in shirts and long skirts. Our group found various ways to entertain ourselves as we waited for the parade to begin. 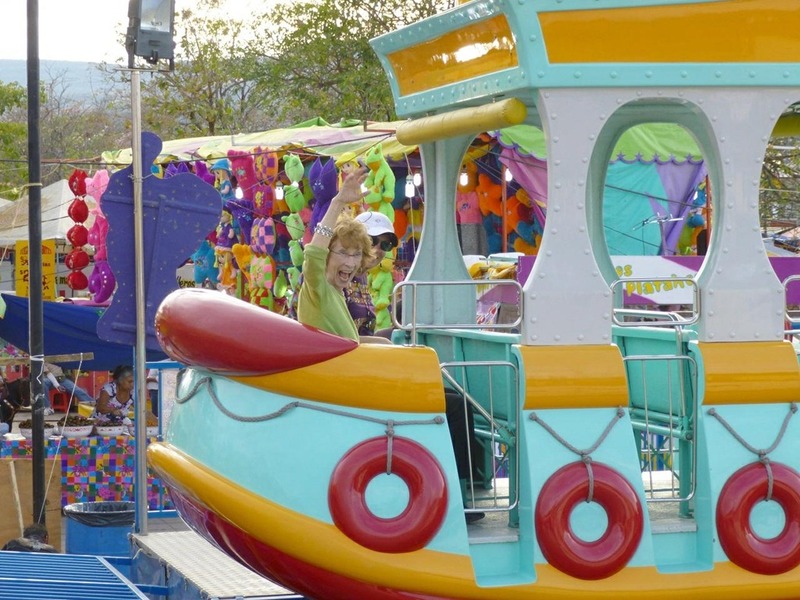 There were rides, people watching and new friends to meet as we enjoyed the day. 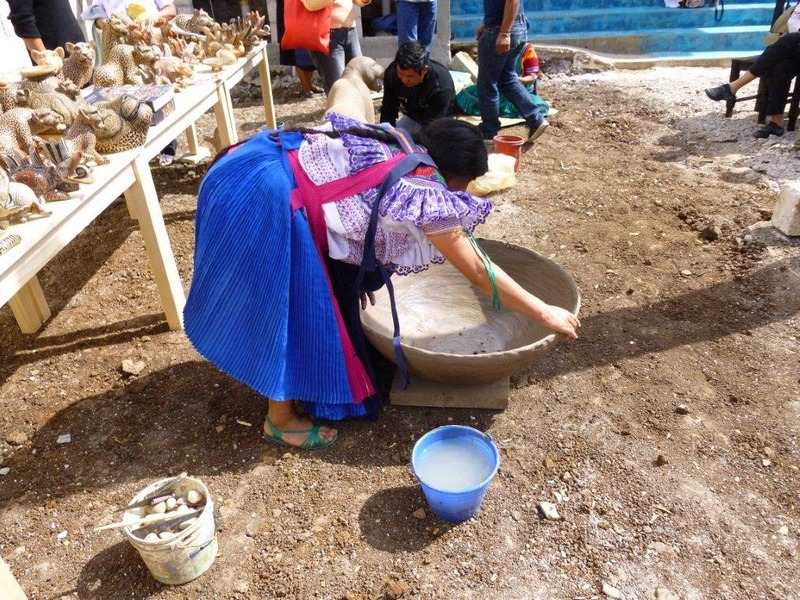 The small pottery-making village of Amatenango del Valle is 40 km southeast of San Cristóbal de Las Casa on Carretera Panamericana (Highway 190). It is a village of about 6,500 people. The name Amatenango means place of the amates (figs). It was settled in the pre-Hispanic period by Tzeltal Maya. 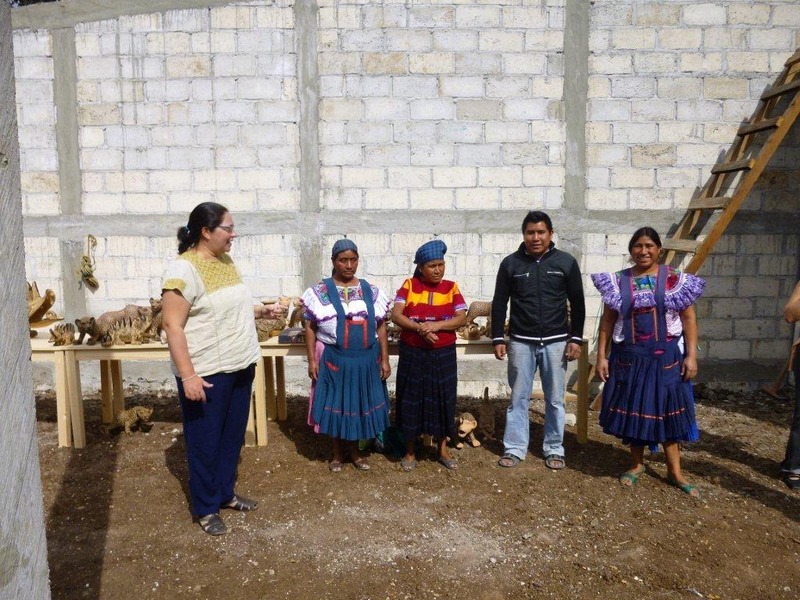 In this village we saw an incredible display of classic Tzeltal Maya artisanship. 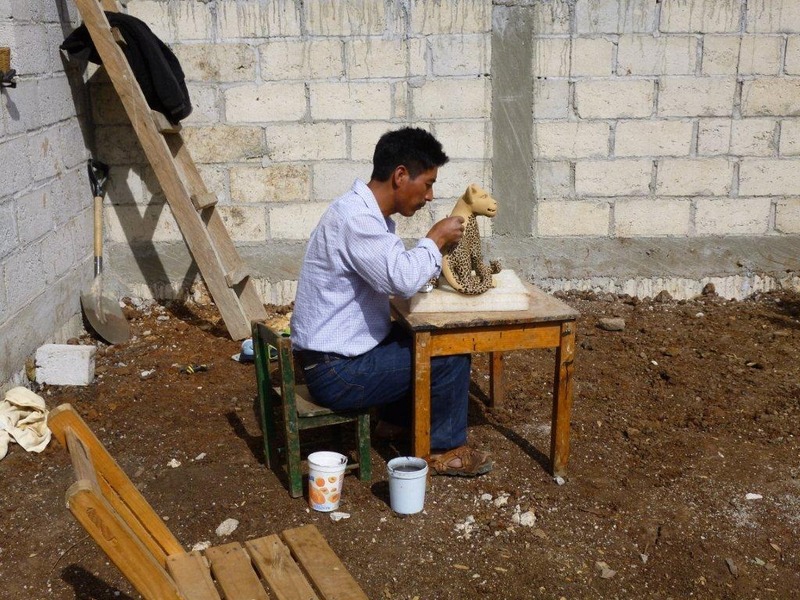 All of the pottery is created free hand; no wheels or molds are used for any of the items. Although the men wear western jeans, boots and hats, the women wear traditional clothing. Their blouses are brightly colored, woven cotton embroidered with wool yarn and dark skirts. Most wear a bright blue head covering. Marina got us an audience with Juana Gómez Ramírez (Xhana Compash Otol in Maya). 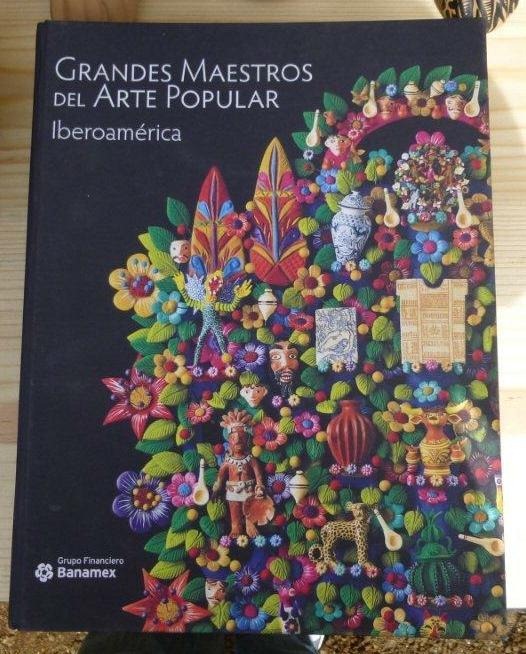 She was a featured artist in the Formento Cultural Banamex, AC sponsored book: Grandes Maestros del Arte Popular. 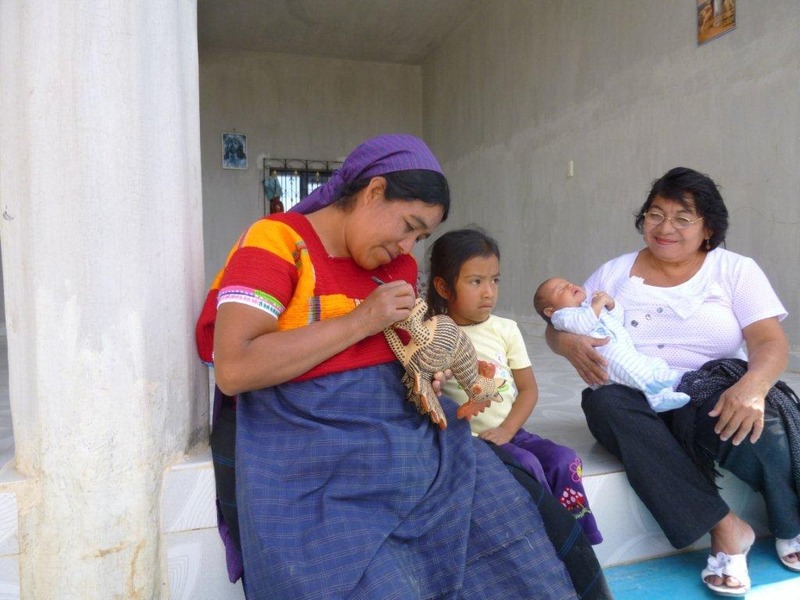 As you can see from some of the pictures, Juana’s entire family is involved in the trade. 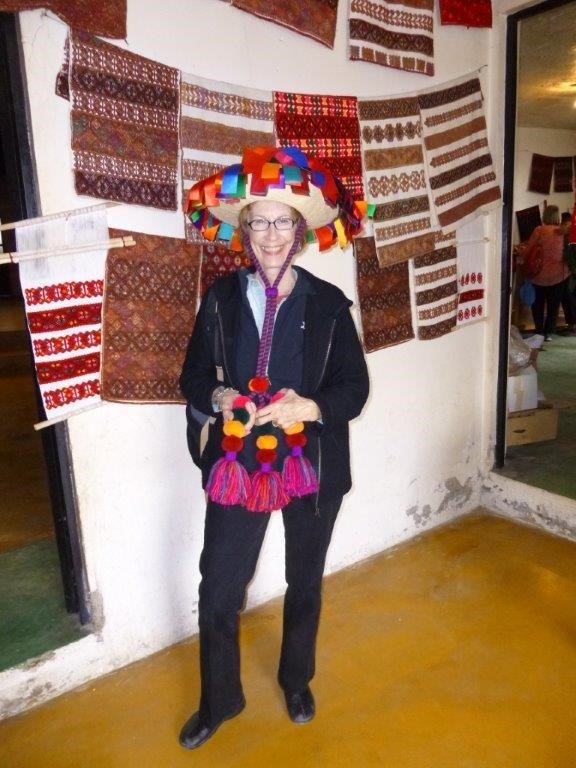 Juana described to us the process used to create these fine works of art. After hearing the process, I no longer question the prices charged by the artists for their work. Pieces are hand made from barro (clay), sun-dried and then fired in an above ground fire rather than in a kiln – a pre-Hispanic technique. 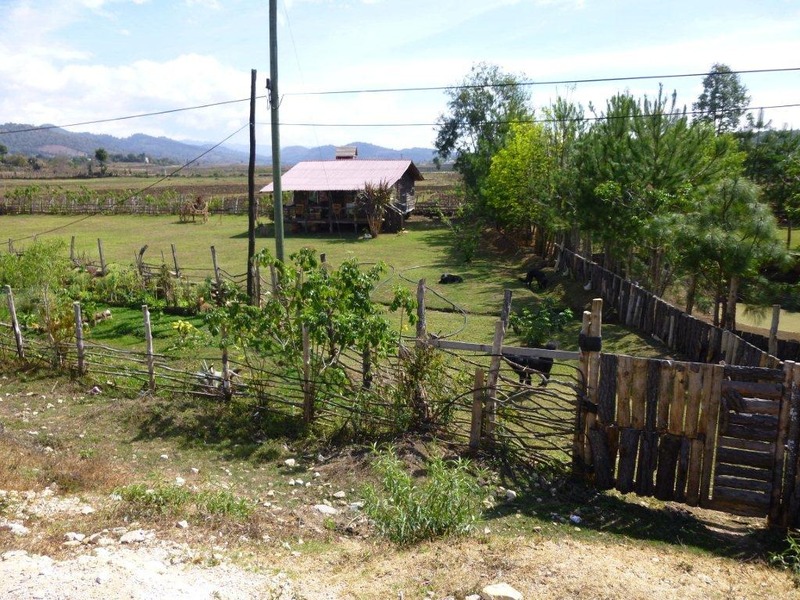 The barro is dug from a nearby stream, cleaned, screened and worked to remove impurities. Afterwards, arena (sand) [hand dug from a sand pit nearby] is methodically added to the raw barro. The arena is added to allow the barro to dry faster and, most importantly, gives the barro the strength needed to "stand up." The more body the barro has, the higher or longer the pieces can be without collapsing. Again I want to emphasize, all of the pieces are hand formed; no molds, no wheels. After the pieces dry naturally, they are "fired" in the open air, covered in wood for large pieces and in a concrete block wall area for smaller pieces. After firing, the pieces are hand painted. The only item purchased in the entire process is the Comex paint they use to paint the intricate details of the pieces. We bought a beautiful sculpture of a balam (jaguar) like the one shown here and a very unique iguana! 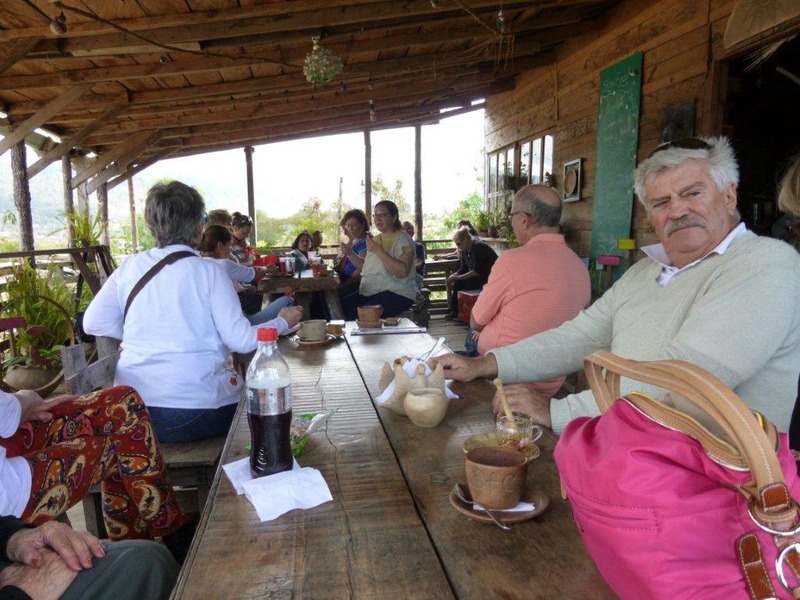 After leaving Juana and stowing our treasures in the autobus, we then went to Mi Café just a kilometer or so up the road. 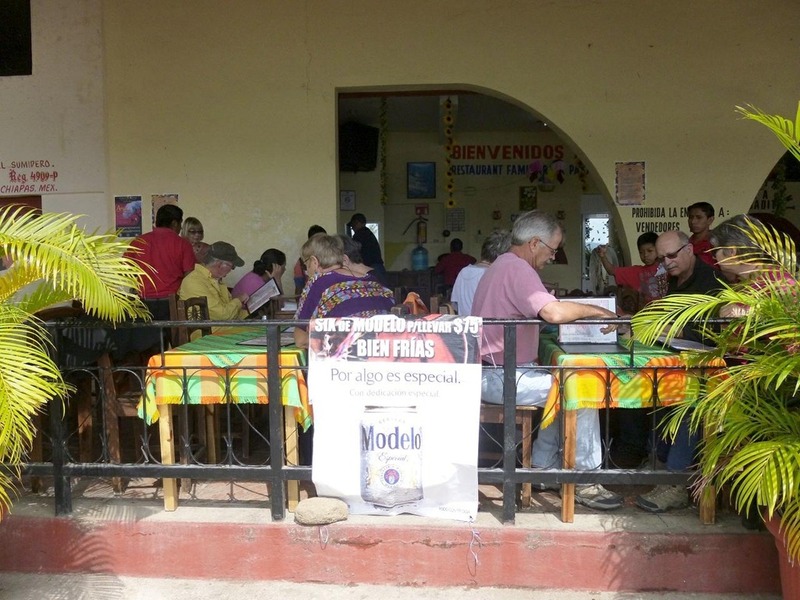 Mi Café is owned and operated by Joel Aguilar. 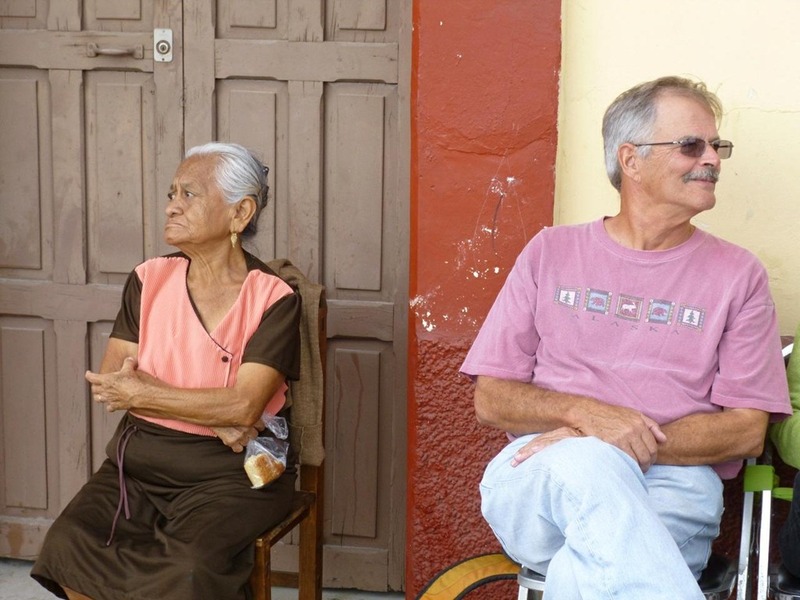 We stopped here to relax and discuss the things we had seen so far on our "Voyage to Chiapas. Marina fielded questions from the group and a great discussion was had. Joel spoke to the group about his passion for all things organic; from the coffee he serves which is grown in the area to his produce that he grows in the gardens surrounding the café. He feels it is important for the local population to continue eating and producing traditional foods. He is adamantly against the new supermarkets with processed foods. 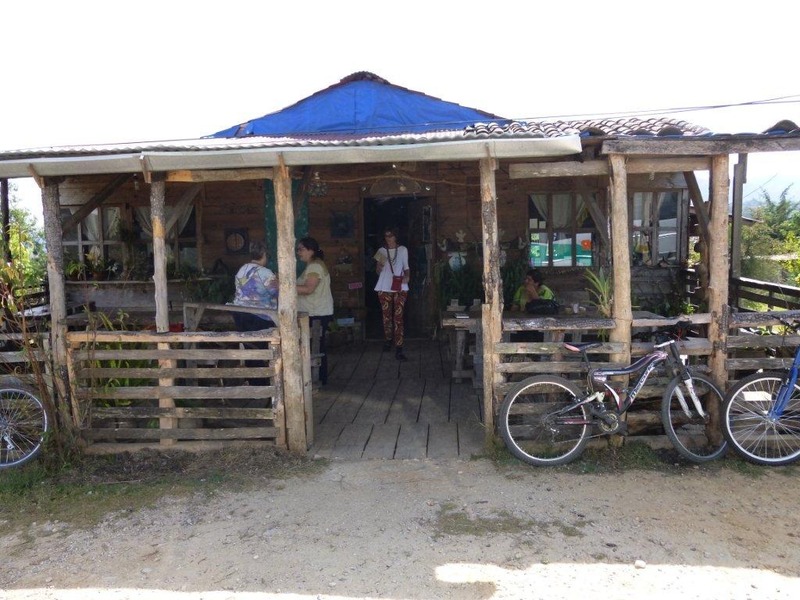 The café is filled with eclectic art, handmade pottery, organic eggs, herbs and packages of coffee all in a rustic setting, reminiscent of an old west general store with overstuffed furniture. It was a nice break in the action. 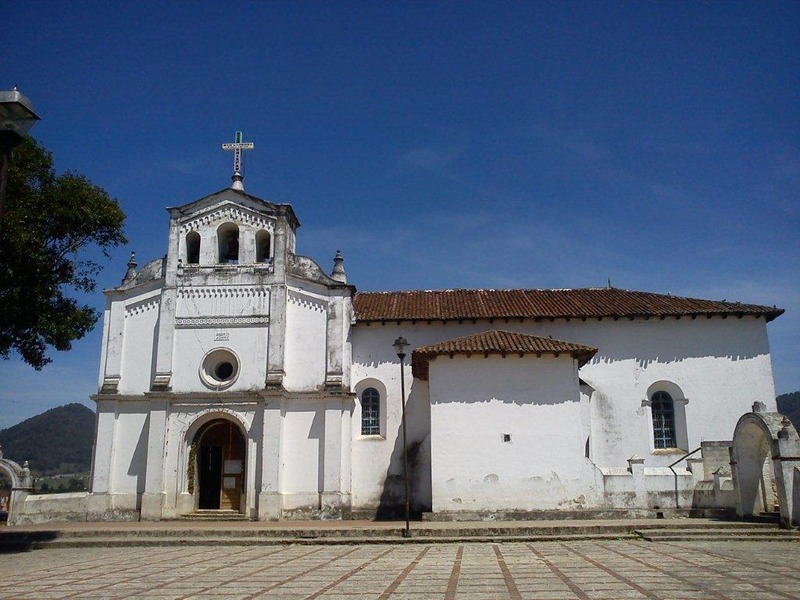 San Juan Chamula (Saint John of the dead [or dried] lake) has over 50,000 inhabitants and is located just 10 km from San Cristóbal de las Casas. 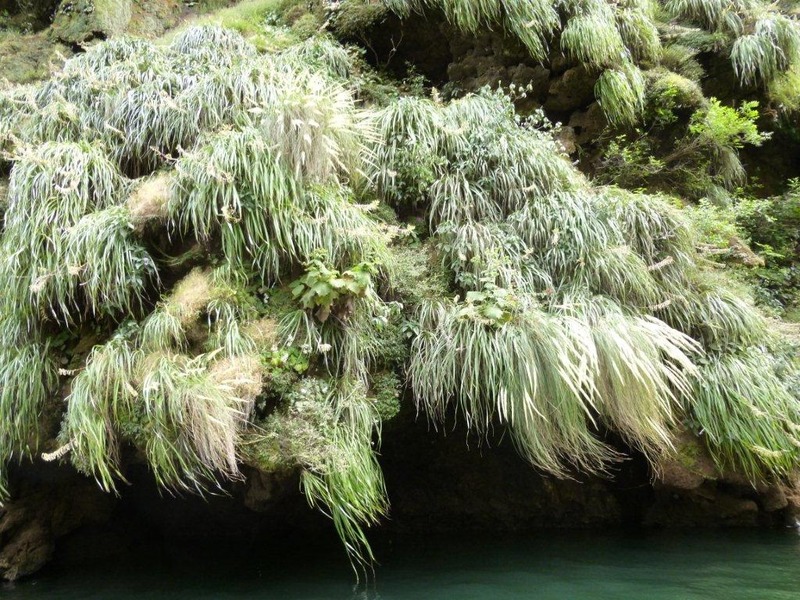 It is in the Chiapas highlands and boasts an altitude of 7,200 feet. 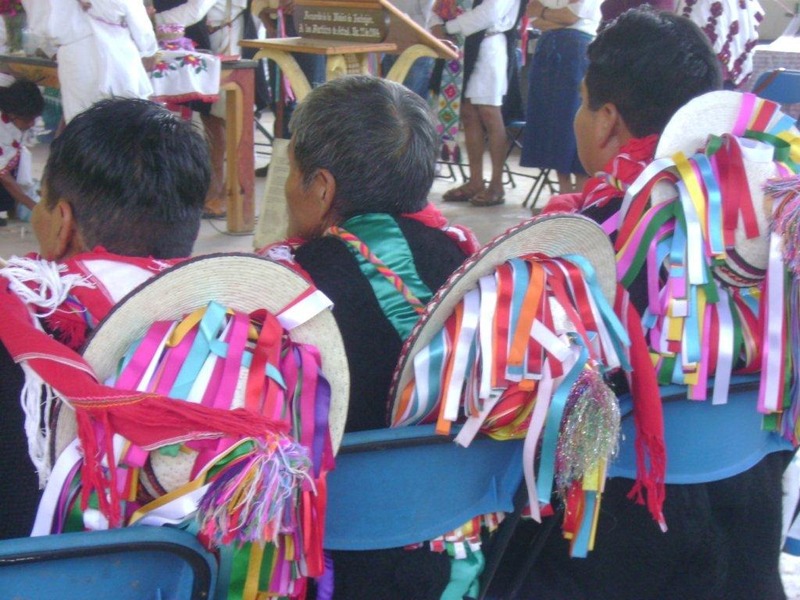 The inhabitants are indigenous Tzotzil Maya and speak Tzotzil. 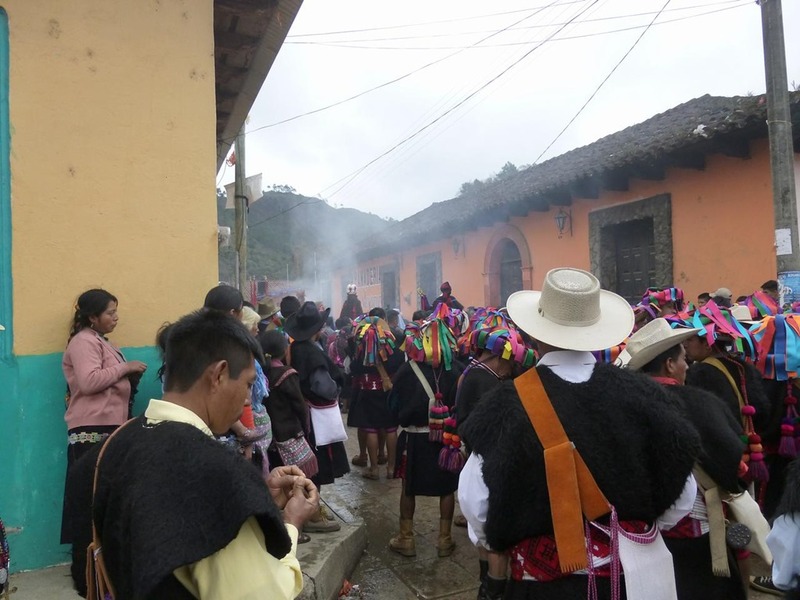 They hold a unique autonomous status with Mexico meaning that no outside police or military are allowed in the village. 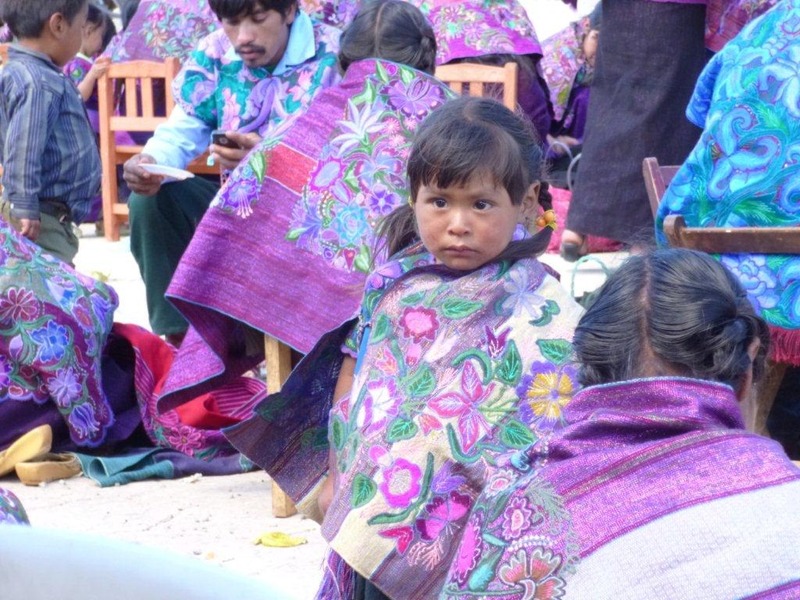 Photography in Chamula is very difficult as parents will hide their children or they themselves will turn away as soon as they spot a camera. Photography within the church is strictly prohibited as is photographing any religious ceremonies outside the church in the square. They can, and will, ask you to leave town if you violate the rules. The photos posted here of inside the church and the ceremony outside were found on the internet and were not taken by us. 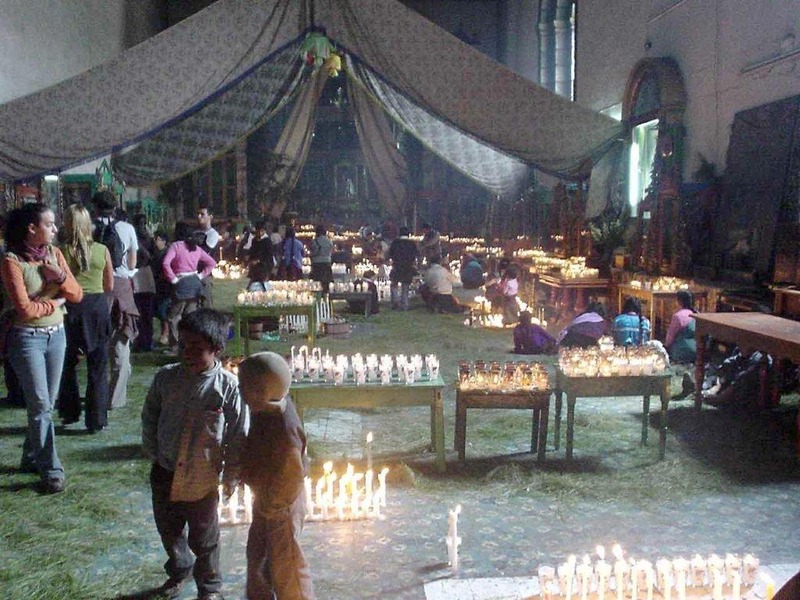 The church of Chamula (The Temple of San Sebastian) is filled with burning candles and copal resin incense. There are no pews in this church and the floors are covered with pine bough rushes,. The combination of candles, incense and pine creates a very pungent, smoky atmosphere. Even though there are statues of saints along the walls and a sacerdote (priest) present, what you see here is a special form of Catholicism. 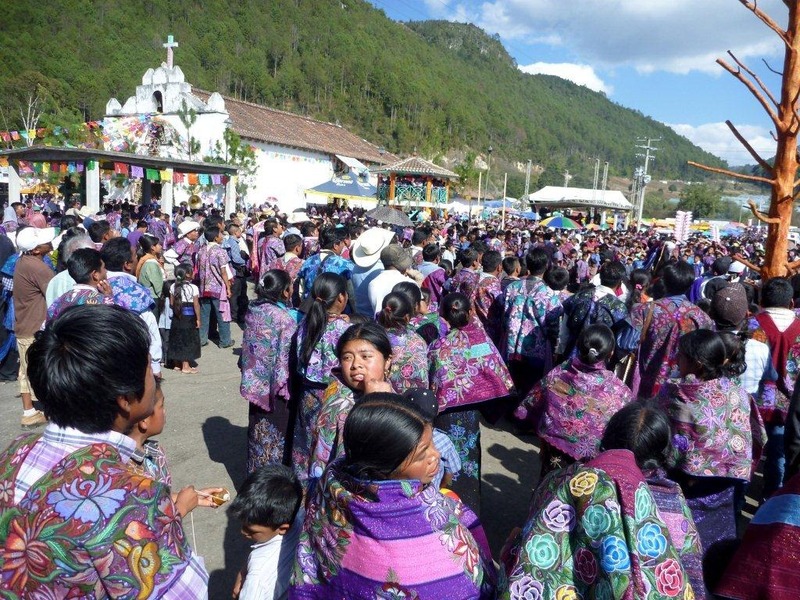 It is a blend of Maya customs, Spanish Catholic traditions and local innovations. 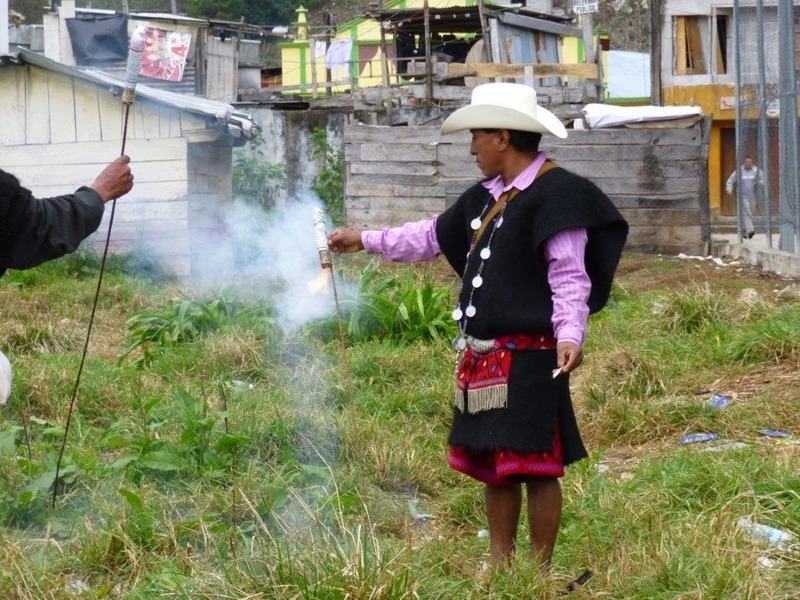 At the altar are Curanderos (healers) that will diagnose all forms of ills. The remedies range from candles or certain flowers to the sacrifice of a live chicken. The Curanderos and the petitioners alike drink ceremonial cups of pox (pronounced posh) a blend of distilled sugarcane and pineapple. 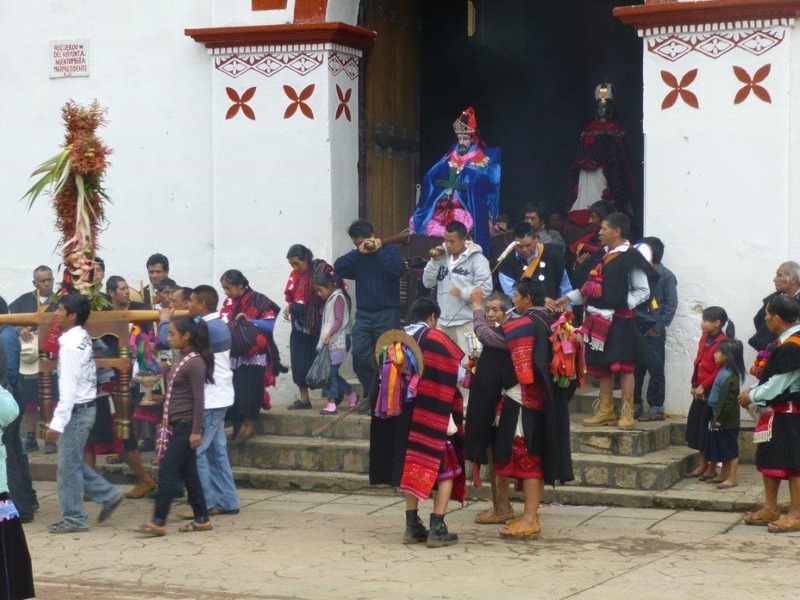 The prayers are chanted in the native Tzotzil. 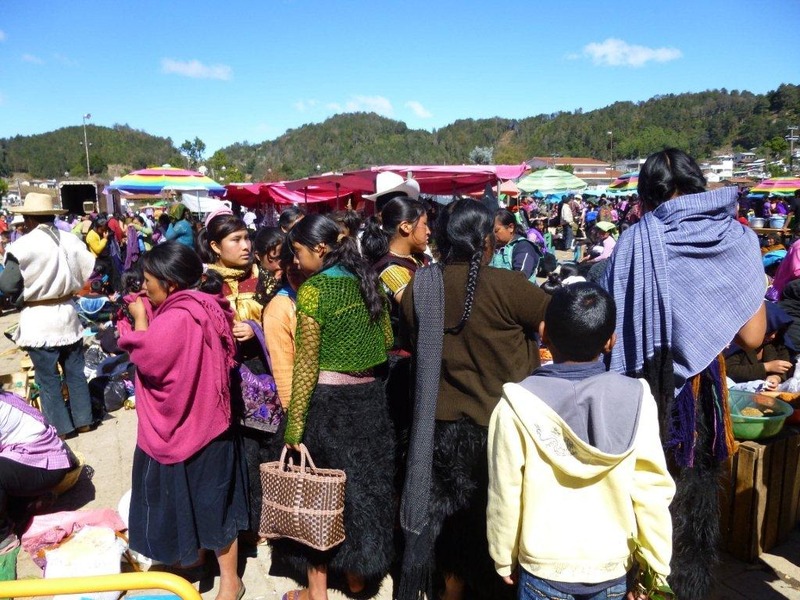 The women of Chamula are excellent wool weavers as wonderfully demonstrated by the distinctive traditional clothing of heavy wool skirts for them and the woolen vests worn by the men. San Lorenzo Zinacantán is about 7km west of Chamula. 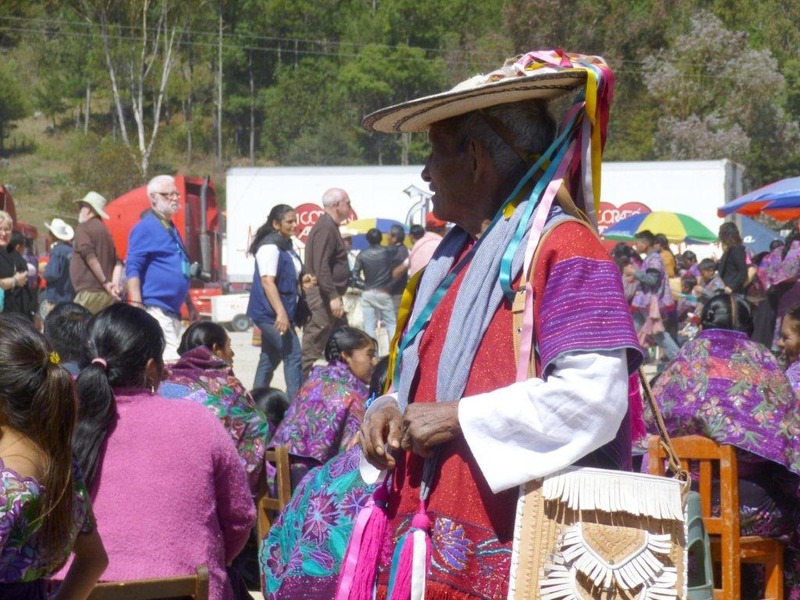 Like Chamula, the people of Zinacantán are Tzotzil Maya. 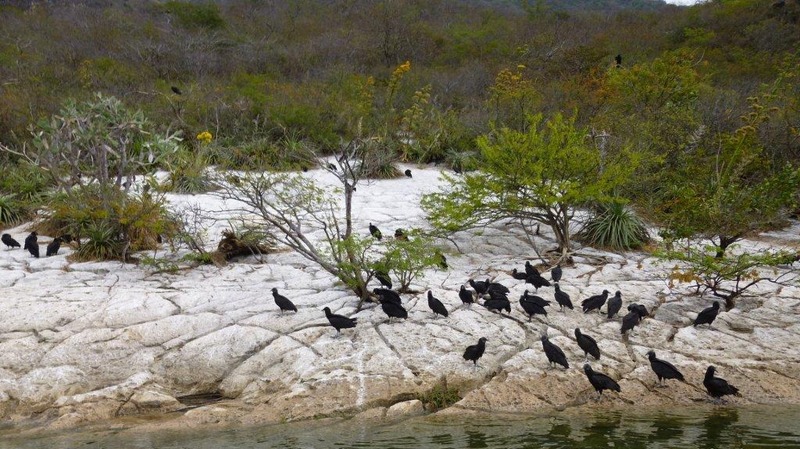 Zinacantán means "land of bats" in the Nahuatl language. 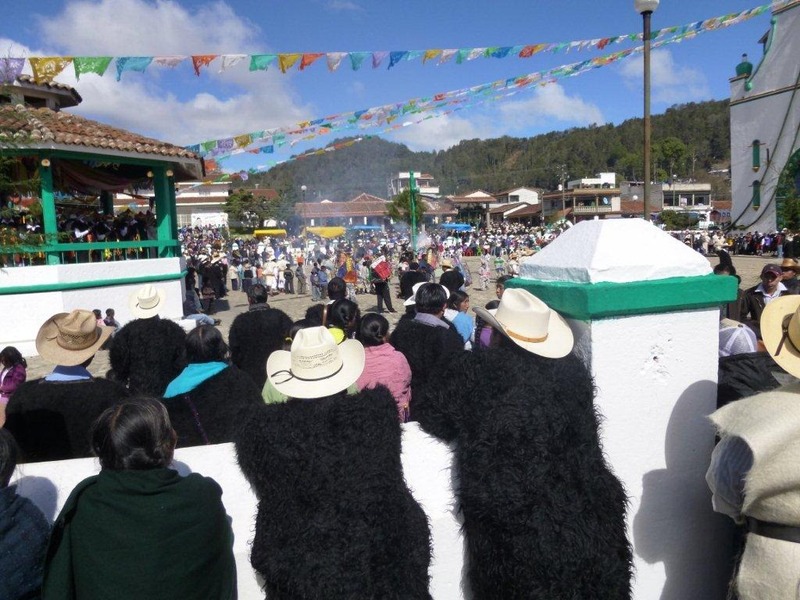 The people here speak Tzotzil and they call their city Sots’leb, also meaning "land of bats." The people here are not camera shy as in Chamula. They even seemed to enjoy watching the crazy tourists. Today the flower trade is the primary vocation of the residents. As you drive into the city you see the hillsides dotted with greenhouses. 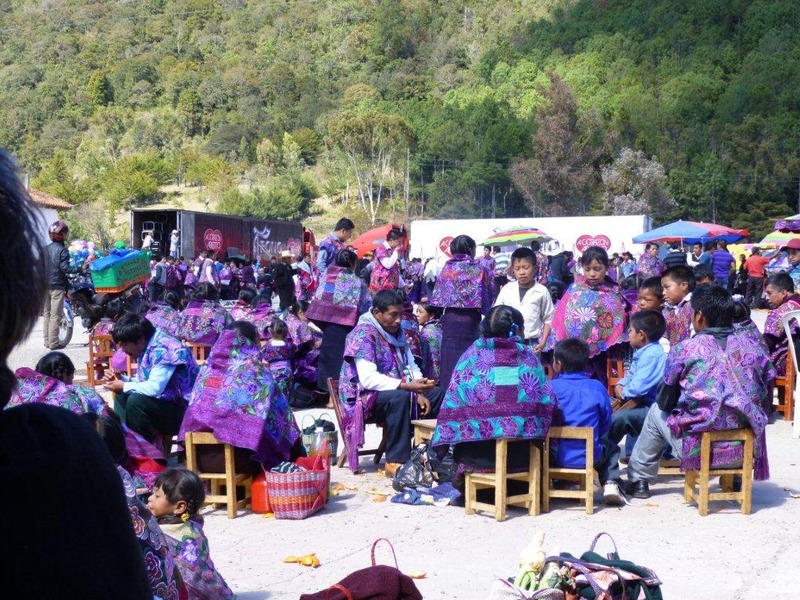 It was the most colorful community we visited as exemplified by their brilliant red, blue and purple clothing embroidered with large flowers and accented by colorful tassels. We arrived in time for the feast of San Sebastian which runs from January 18 to 22. The church here is San Lorenzo and the proceedings appeared to my eye to be yet another step further away from Catholicism. Here the men are in charge of every feast serving one year in any specific position. There are three positions that can be held. They are: Martomoetik (administrator), Alperesetik (standard bearer) and Moletik (teachers). The men have to pay to achieve any of these positions. There are 12 Martomoetiks, 12 Alperesetiks and 6 Moletiks. The Martomoetiks buy whatever is needed for the feast, e.g., flowers, candles, pine boughs, etc. The Alperesetiks buy and prepare everything outside of the church, including fireworks. The Moletiks teach the younger men the roles of each position. One of the events during the celebration was the gathering of food for winter. The Alperesetiks go to each vender using stuffed squirrels as a threat to give them bounty to store for the winter. 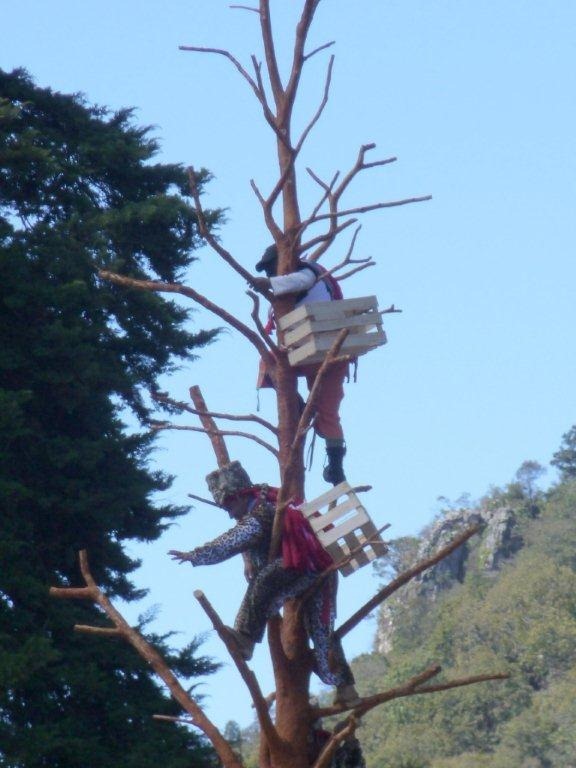 After the bounty has been gathered, the men climb the "naked tree" with baskets or crates. Young men on the ground throw the stuffed squirrels up into the tree, where they are caught and stored in the crates.